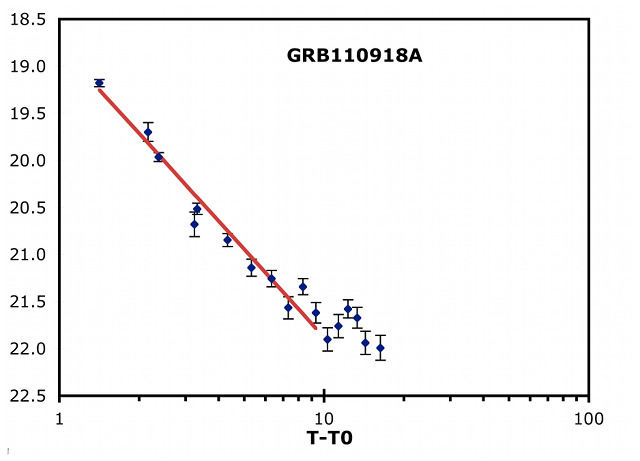 Long-time GRB observer Arto Oksanen used the robotic Harlingten Observatory telescope in San Pedro de Atacama, Chile to obtain more than two weeks' worth of observations of the powerful gamma ray burst GRB 110918A, conclusively showing a steady power-law decline during the two weeks following the burst. His observations prove that there was no early jet break in this gamma ray burst as was previously suggested. These observations were published in GCN Circular 12458 by Arto Oksanen, Bradley Schaefer, Caisey Harlingten, and Matthew Templeton. Many thanks and congratualations to Arto for his work on this GRB!